Who would have imagined a future link between the rosy-cheeked toddler in this Kentucky painting and the Russian imperial court? free and independent “Commonwealth” and join the recently established union as its fifteenth state. A graduate of Transylvania College in Lexington, he had taken part in the Indian campaigns and acted as aide-de-camp to General Harrison in the War of 1812. During President Monroe’s administration, Smith was a Representative in Congress; immediately afterwards, he went on a mission to South America for President John Quincy Adams. President Andrew Jackson appointed him U.S. District Attorney for Kentucky. Smith also served six terms in the Kentucky Legislature, part of the time as Speaker, and four years in the state senate. 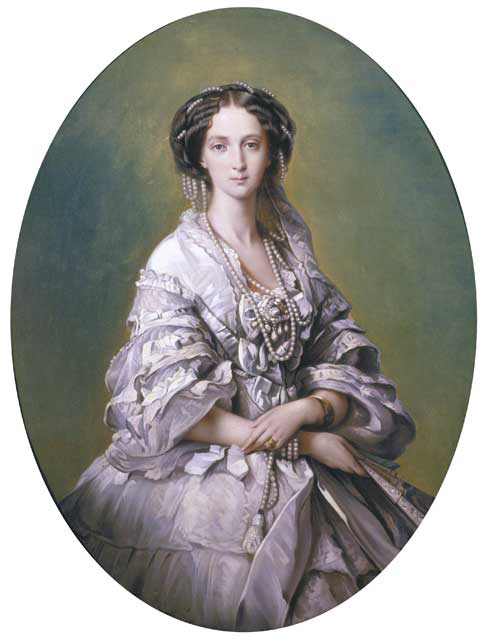 In 1815, on his twenty-third birthday, John married Elizabeth Lewis Clay (1798-1887), then seventeen. Eliza was the daughter of General Green Clay, a veteran of both the American Revolutionary War and the War of 1812, and a cousin of famous Kentucky statesman Henry Clay and Alabama governor Clement Comer Clay. Green Clay was thought to have been the wealthiest man in Kentucky of his time, reputed to own tens of thousands of acres, several distilleries and a tavern, and many ferries across the Kentucky River. The charming new home shown off in the John Speed Smith Family portrait had been built in 1818 on land given by Green Clay to his daughter. (The Smiths lived here until 1829, when John built “Castle Union” near Speedwell in Madison County; their original one-story brick Georgian house on North Street at Aspen Avenue in Richmond was demolished in 1957.) The painting reveals in unusual detail a fashionable interior of that time, with patterned carpet, decorated “fancy” chairs, and sheer curtains behind red drapes. Along with the stylish clothing, from the Colonel’s fancy ruffled shirt and gold watch fob to his wife’s empire gown and comb tucked into a modish ringlet hairdo, this portrait gives a glimpse into an unexpectedly refined lifestyle in what was still considered a “frontier” state. The book Eliza is holding indicates her education as well, fairly uncommon for women of the day. This portrait is considered a major visual portrayal of Kentucky life and its significant role in American history. It is also a remarkable example of early work by Chester Harding (1792-1866) who at this time was still self-taught. Born in New England, he had tried a variety of trades before moving to Pittsburgh, where he began painting signs and houses. 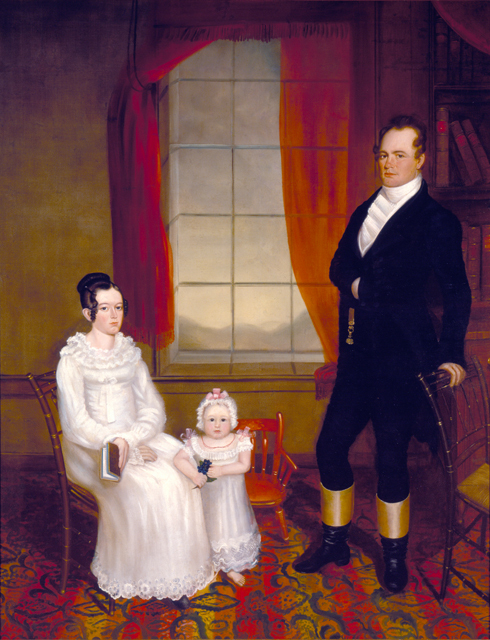 Around 1818 an itinerant artist introduced Harding to portraiture, at which he had some success before moving to Kentucky to join his brother, a carpenter and chair maker living in Paris. Harding found that painting was his passion and he became quite a popular portraitist in the region, charging $25 for each, half of what Matthew Jouett in nearby Lexington was getting. Harding earned enough money to afford formal training and eventually went on to great fame after studying in Philadelphia, in London with Sir Thomas Lawrence, and in that “other” Paris (i.e., France) before returning to America and settling in Boston. But back to the Russian connection with that barefooted little girl in the pink-ribboned bonnet and matching coral necklace … One of Sallie Ann’s future brothers, Green Clay Smith, was a member of Congress when Kentucky-born President Abraham Lincoln was nominated for a second term and he came within one vote of being Lincoln’s running mate. One of Sallie Ann’s uncles, Eliza’s brother Cassius Marcellus Clay, nicknamed “The Lion of White Hall”, became well-known as an abolitionist and was appointed by Lincoln to be Minister to the Russian court at St. Petersburg. (In 1853, Cassius M. Clay granted ten acres to another abolitionist, John G. Fee, who founded the town of Berea and, in 1855, Berea College, the first non-segregated, coeducational college in the South and one of a handful in the nation to admit both male and female students at that time.) As Cassius M. Clay was preparing to go abroad, the Civil War broke out with no federal troops in Washington, D.C., so before departing he organized a group of 300 volunteers, dubbed “Cassius M. Clay’s Washington Guards”, to protect the White House and U.S. Naval Yard from a possible Confederate attack. Sallie Ann’s son, William Cassius Goodloe, withdrew from his senior year at Transylvania to be his great-uncle’s private secretary in St. Petersburg; Goodloe also acted as Secretary of Legation until the summer of 1862, when he returned for a commission in the Union army. After Czar Alexander II issued the 1861 Emancipation Manifesto freeing the serfs in Russia, Cassius M. Clay pressured Lincoln to issue an emancipation proclamation in America; later he was influential in negotiations for the purchase of Alaska. The Czar presented these portraits of himself and his wife, Czarina Maria Alexandrovna, to Cassius M. Clay before his final return to America in 1869. And if the name sounds a bit familiar, it was indeed shared by Louisville-born boxing champion Muhammad Ali and his father, until Ali‘s conversion to Islam in the 1960s. 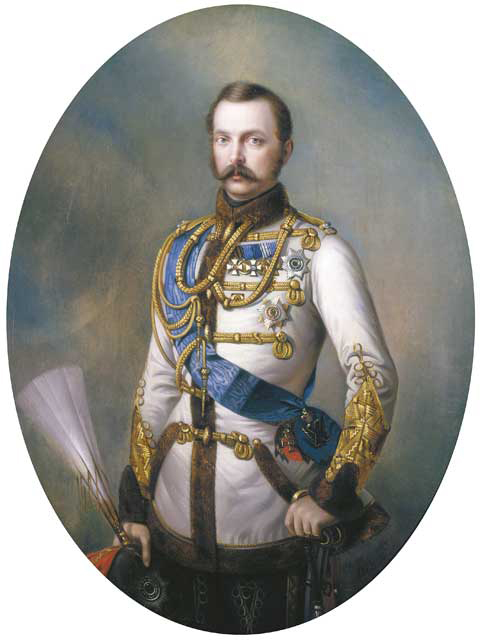 The portraits of Czar Alexander II and Czarina Maria Alexandrovna are on view in the Kentucky Historical Society’s exhibition “Great Revivals: Kentucky Decorative Arts Treasures” at the Old State Capitol in Frankfort, Kentucky, until 2015.